The road to success in the music business can be hard. One way to increase awareness is to feature famous artists. To promote their new album and tour, and get recognised in the US Motherland of Hip Hop, British Rap combo Too Many T’s were looking for a big name to partner with. In a world first, they got support from one of the most well-known vocalists in the world: Alexa, the AI voice assistant from Amazon, present in millions of devices in homes around the globe. With their song “Featuring Alexa”, Too Many T’s manage to use Alexa as their singer, because the lyrics contain voice commands that trigger any Alexa device and the beat is produced to precisely match Alexa’s replies. 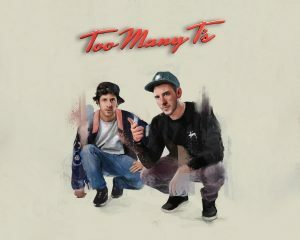 The song, made in partnership with Serviceplan Group, released through a video on Social Media, starts with Too Many T’s MCs Ross and Leon sitting in the studio, fantasising about how to become famous like Kanye West, they figure out they could be using the well-known auto tune voice effect that’s famously used by Kanye West and many other Hip Hop acts. As neither of the T’s can naturally sing in auto tune, they jokingly ask their Alexa device if she can. To their surprise, she responds singing in auto tune, from which point the song unfolds with more commands integrated into the lyrics, from asking Alexa to calculate the amount of streams needed to make a million pounds in streaming revenue, to commanding her to play a Too Many T’s song in the end to create revenue from streaming. The song is released with and without the Alexa replies, encouraging listeners to play it with their own Alexa device to bring the performance to their own home. The song is using only native Alexa commands without the use of any additional skill.